Extreme weather conditions associated with climate change could pose a major threat to military installations. Now, a new government report says that the damage has already begun, and is having an impact on the military's readiness for combat. The Department of Defense has identified five climate change phenomena that could affect its operations: (1) rising temperatures; (2) changes in precipitation patterns; (3) increasing storm frequency and intensity (coastal and inland); (4) rising sea levels and associated storm surge; and (5) changes in ocean temperature, circulation, salinity, and acidity. 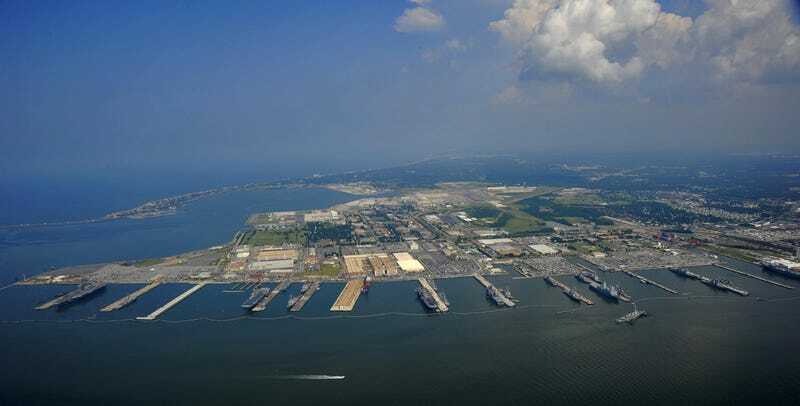 The Government Accountability Office was asked to assess the Pentagon's progress in taking action to adapt its infrastructure to the challenges of climate change. In doing so, GAO researchers met with military officials and visited installations. "Officials at several locations told us that they observed multiple types of what the Department of Defense has identified as potential climate change phenomena, potential impacts, or potential vulnerabilities," the GAO notes. The combination of thawing permafrost, decreasing sea ice, and rising sea level on the Alaskan coast have led to an increase in coastal erosion at several Air Force radar early warning and communication installations. According to installation officials, this erosion has damaged roads, utility infrastructure, seawalls, and runways…..As a result, only small planes or helicopters are able to land in this location, as opposed to larger planes that could land on the runway when it is fully functional. Daily operations at these types of remote radar installations are at risk due to potential loss of runways, and such installations located close to the coastline could be at risk of radar failure if erosion of the coastline continues. Air Force headquarters officials noted that if one or more of these sites is not operational, there is a risk that the Department of Defense early warning system will operate with diminished functionality. Officials at an installation in the Pacific told us that in 2008 they experienced 43 straight days of rain that resulted in mud slides and flooding that damaged base infrastructure, including base housing. By contrast, [other] officials provided examples of impacts from reduced precipitation—such as drought and wildfire risk….For instance, officials also told us that for the last 3 to 4 years, there has been a continuous drought at another nearby installation, which has led to an increased number of wildfires in the area. As a result of a 2012 wildfire, officials were unable to access or move ammunition at that installation for 4 days. At a third installation in the same area, officials explained that these drought conditions—and the threat of wildfire—have limited the types of ammunition that can be used on certain training ranges. As a result, units have had to spend extra time and money to travel to other installations to complete their required training. Officials stated that they had observed increasing storm frequency and intensity and associated potential impacts such as flooding…. For example, officials at an installation located in the desert Southwest explained that flash flooding due to an intense rain event had made one of their emergency runways unusable. According to these officials, it took about 8 months for the flooding to subside. During that time, aircraft performing training and testing missions could not use the emergency runway. Although intense rain events such as the one mentioned above occur periodically in the desert Southwest, the Department of Defense recognizes in its Roadmap that increases in heavy downpours are projected to increase as a result of climate change. Officials on a Navy installation told us that sea level rise and resulting storm surge are the two largest threats to their waterfront infrastructure. For example, they explained that they were planning to lengthen a Los Angeles–class submarine to convert it to a training platform and that this will entail cutting the submarine in half. During this process, the submarine will sit in a dry dock with its interior open. Officials explained that they were concerned about possible storms and associated storm surge, noting that if salt water was allowed to flood the submarine's systems, it could result in severe damage. Such damage would delay completion of the submarine's lengthening by 3 to 4 months. Although the GAO gave the Pentagon high marks for its efforts to date, the agency has encouraged the Department of Defense to development a more systematic assessment plan if it hopes to finish collecting data on 7,591 installations worldwide "in a timely and complete manner." Unfortunately, for the time being, the Pentagon is prohibited from initiating any long-term projects to fortify or restructure its facilities to prepare for more severe weather conditions. None of the funds authorized to be appropriated or otherwise made available by this Act may be used to implement the U.S. Global Change Research Program National Climate Assessment, the Intergovernmental Panel on Climate Change's Fifth Assessment Report, the United Nation's Agenda 21 sustainable development plan, or the May 2013 Technical Update of the Social Cost of Carbon for Regulatory Impact Analysis Under Executive Order. Our climate is obviously changing; it has always been changing. With all the unrest around the global [sic], why should Congress divert funds from the mission of our military and national security to support a political ideology. This amendment will ensure we maximize our military might without diverting funds for a politically motivated agenda. The Pentagon and the GAO beg to differ.